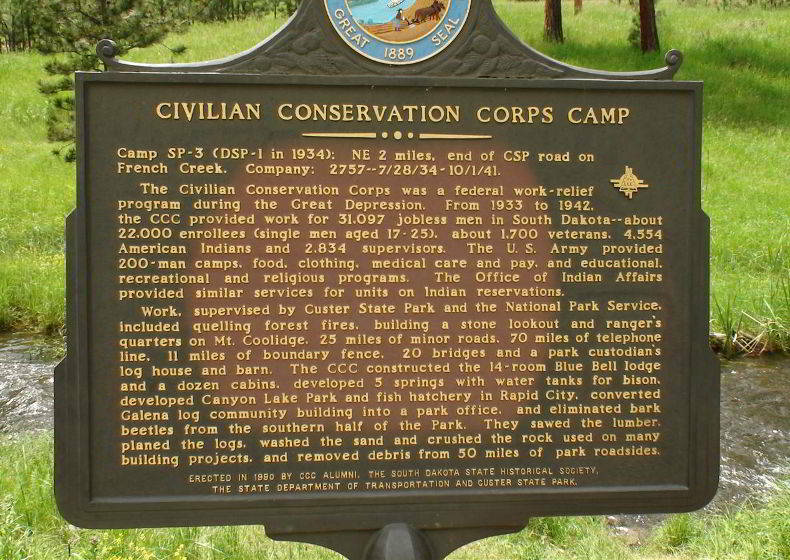 South Dakota Civilian Conservation Corps (CCC) camp Camp Narrows was located in Custer State Park. Camp Narrows was at first called "Robber's Roost," and later was sometimes called Blue Bell. Located in Custer Park, it was built on the bank of French Creek in a natural bowl surrounded by three heavily timbered hills. When completed, the walk around the parade ground was 1/4 mile long (1935). 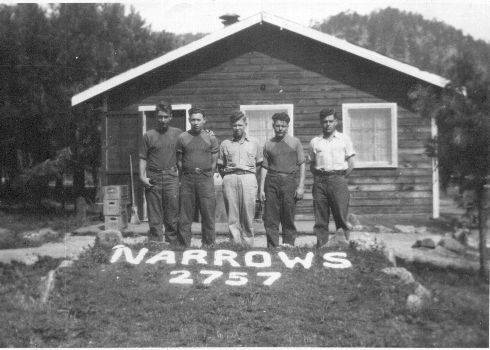 The following can be read on the roadside sign located in Custer State Park near Blue Bell Lodge and the one-time CCC camp known as Narrows. It is but a brief description of the work done by the Civilian Conservation Corps that provided the state with a nationally known park, tourist destination and wildlife preserve. There are very few areas of Custer State Park that do not showcase roads, structures (still in use) and artifacts of the work done by the CCC Boys. Camp SP-3 (DSP-1 in 1934); NE 2 miles, end of CSP road on French Creek. Company: 2757--7/28/34 - 10/1/41. 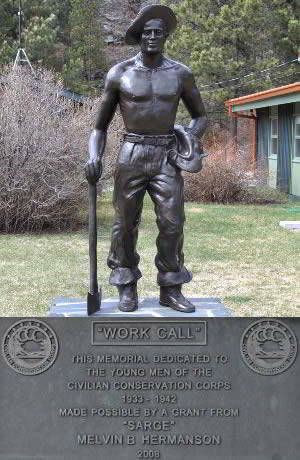 Work supervised by Custer State Park and the National Park Service, included quelling forest fires, building a stone lookout and ranger's quarters on Mt. Coolidge. 25 miles of minor roads, 70 miles of telephone line, 11 miles of boundary fence, 20 bridges and a park custodian's log house and barn. The CCC constructed the 14-room Blue Bell lodge and a dozen cabins, developed 5 springs with water tanks for bison, developed Canyon Lake Park and fish hatchery in Rapid City, converted Galena log community building into a park office, and eliminated bark beetles from the southern half of the Park. They sawed the lumber, planed the logs, washed the sand and crushed the rock used on many building projects, and removed debris from 50 miles of park roadsides. THE STATE DEPARTMENT OF TRANSPORTATION AND CUSTER STATE PARK.